This is a very rough transcript of how I remember Andrew Marr interviewing the Labour leader, Ed Miliband, on the revealingly named “Andrew Marr Show”, BBC1 television, Sunday 30 September 2012. I can’t of course vouch for its accuracy. But for those who missed it, or switched it off after the first three minutes, this may help to give the flavour. 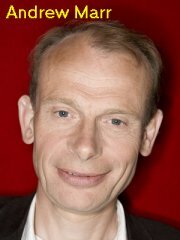 Andrew Marr: I’m joined now by Ed Miliband as he comes to Manchester for his party conference, at which he’ll have to expect to be judged by not only his party but by the whole country on his claim to be the country’s next prime minister. He’s widely regarded as a weird pointy-headed nerdy figure, more at home in the university lecture-room discussing ideas than convincing the man in the pub that he’d be better off under a Miliband Labour Government. Ed Miliband, welcome to the Andrew Marr Show. AM: So this is your opportunity, Ed, to reveal the closely guarded secrets of what specific policies we may expect a Miliband government to pursue, if you succeed in the elections in 2015. We really have no information so far about what you would do about public spending, for example. Would you cancel the coalition government’s cuts and repeat the familiar Labour policy of reckless spending? AM: So you would increase government spending. I think it’s the first time you’ve admitted that. It means the deficit would also actually increase, doesn’t it? AM: You still haven’t told us which coalition cuts you would reverse or where the money would come from for all the additional spending. How can you expect to win the trust of the British people when you won’t come clean about your spending plans? AM: All right, so we still don’t know. Now, will you at least tell us whether you would work with the LibDems if there’s a hung parliament after the next elections and Labour is the biggest party? How can you ask voters to support Labour if you won’t even tell us honestly what you would do if you fail to win an overall majority? Isn’t that rather arrogant? AM: So you won’t answer my question. Let me put this to you: will it be a condition of a Miliband government working with the LibDems that Nick Clegg is no longer their leader? I think we’re entitled to know that at least. AM: Let’s talk about the condition of the Labour party. It’s widely believed that you and the shadow Chancellor, Ed Balls, have a difficult relationship. Have you really forgotten the harm that was done to Labour by the terrible relationship between Tony Blair and Gordon Brown? If so, you must have a very short memory. AM: We’ll come on to that in a minute. Just now I want to ask you about another thing which you have been very secretive about – the role in the Labour party of your brother, David, who is older than you and more experienced: how does he feel now about the way you wrecked his hopes of becoming party leader, your own brother? AM: You’re generally thought to be indecisive. You were certainly decisive when you decided to run against your own brother for the leadership! Can you think of any other clear-cut decisions on policy matters that you have taken since you went into politics? AM: So you can’t think of a single one? AM: All right. Let’s talk a bit about your private life. People have been ridiculing you for having yourself photographed with your wife and two small children, arriving in Manchester yesterday for the conference. Is that what we have to expect now from you: all folksy family schmaltz and no policies? AM: So you still haven’t told me in concrete terms what you would like to do about relations with the EU, or Afghanistan, or the trade deficit, or how you would get on with Mitt Romney if he wins the US elections, or really anything at all about international affairs. For example, now is your chance to tell me in detail how you would propose to bring the violence in Syria to an end if you were prime minister now. AM: We’ll come on to that in a moment. I want to ask you about the banks. You’ve been quoted as saying that you would point a gun at the head of the banks and threaten to nationalise them if they don’t obey your order to separate their international investment operations, or casino banking as I think you call it, from their ordinary high street banking operations. Presumably you don’t mind that this would drive all our banks to close down their UK banking operations and move to the United States where they would be more welcome to make a profit and provide badly needed services to the whole financial system? AM: [Turning away from EM to face another camera; EM now out of shot] Now we’re going to be played out by listening to a very attractive young lady whose recent hit single is currently at No. 788 in the charts and rising fast. What brought you into your amazingly successful singing career, my dear? …. Poor EM. And this morning EB was asked tricky questions on the Today Programme. The BBC have it in for New Labour. Brian writes: Thank you for this. Yes, except that I think Ed Miliband has fairly clearly dissociated himself from New Labour! 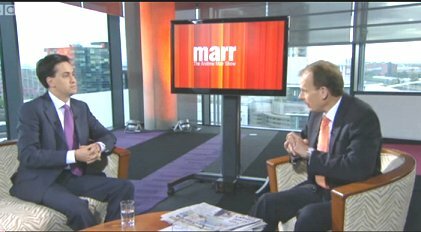 Whilst true that Andrew marr gave Ed Milliband a hard time, your parody of the actual interview says as much about your sensitivity at the labour leader’s failure to put accross his party’s policies clearly and convincingly. I find it amusing that the BBC which has generally been regarded as too ‘pink’ should now be criticised for being anti- Labour, This could suggest that they are getting it about right? Also surely it is EM and EB who are committed to ditching New Labour? Brian writes: Thank you for this, which I fully expected! I think Ed Miliband has made good progress so far in putting across his principles and policies, to the extent that it’s sensible to do so in any detail two-and-a-half years before the likely date of the next election, although clearly there’s more to do on this. He and Ed Balls have also expounded pretty clearly what they would be doing now on the fiscal and economic front if Labour was in power (which is different from what they will do in 2015, obviously). I have not “criticised the BBC for being anti-Labour”, as you suggest: I criticise Andrew Marr (and some of the Today Programme and Newsnight interviewers, although not all) for their aggressive and egotistical style of interviewing which often fails utterly to give the interviewee — not necessarily a Labour interviewee — an opportunity to say what s/he wants to say, or even to answer the questions put to him/her. Some of them, including Marr, seem more concerned to make news by getting their victims to commit “a gaffe” (if necessary by putting grossly distorted words into their mouths) than to allow public figures an opportunity to expound their views and policies. I thought Marr’s interview with Ed Miliband was an especially flagrant example of this. I shan’t be surprised if his performance next Sunday when he interviews the prime minister at the Conservative party conference is just as bad. But as I shall be in Berlin next Sunday, I shall have better things to do than listen to or watch it. I’m afraid I don’t follow your reference to New Labour. Ed Miliband has done a reasonable job in trying to dissociate himself and the rest of the shadow cabinet from the record and style of New Labour (i.e. Blairism), but I don’t see that as relevant to the Marr-Miliband interview. But you need to hear and watch at least half of the interview to make a judgement, and preferably the whole thing. I assume that your parody is faithful to the spirit of the original, as a good parody should be, and that the interview was going out live so that there was no opportunity for editing prior to the broadcast. That being so, why was EM so incapable of telling AM to shut up for pity’s sake and let him finish whatever he was going to say in response to the last question? Had he been warned against seeming like those interviewees who try to give a 15-minute rambling reply to every question? Could he have waffled excessively in the past, and AM have been warned? Brian writes: Thank you, Tim. I don’t know what advice Ed Miliband was given on how best to respond to this kind of aggressive interviewing. It’s difficult to judge which tactic will go down well with viewers and which will antagonise them: come out fighting and complain about being given inadquate opportunities to state your case, or remain resolutely calm and courteous, trying to answer the question however maliciously it’s put? The latter seems to come more naturally to Ed M., and on the whole it has worked quite well for him in the bear-pit of prime minister’s questions in the house of commons. If I were to criticise him for his performance with Marr, I would say that he was overly conscientious about answering the question put to him, instead of using each question to make the key three or four points that he should have been determined to get across regardless of the questions asked. It’s a necessary political skill, especially in the UK where interviewers fight tooth and nail to keep tight control of the agenda, and I’m not totally convinced that Ed M. has mastered it. I don’t think he has ever been guilty of long-windedness or waffle. The fault often suggested is rather a tendency to talk in abstract ideas, which clearly fascinate him, without constantly relating ideas to concrete and specific policies and actions. I have the impression that he’s working on this, but he didn’t have much scope for demonstrating any improvement on “The Andrew Marr Show”, which has only one star — and that’s not Mr Miliband. Brian, I just can’t enthuse about EM ; your parody rings just a bit too depressingly true. Regardless of his intrinsic socialist values and multiple other admirable virtues, he can’t help looking and sounding like a near-perfect replicant who just can’t quite master that last step to becoming a persuasive human being. Much less a politician, where persuasive powers rank above all else – nowadays. Even in his better moments I think he still looks and sounds like an actor trying to perfect his role (Genet’s The Balcony springs to mind…) and there’s no way he’s going to re-invent himself before 2015. In the meantime he might possibly make socialist / real Labour ideas a bit more acceptable to a few marginal voters, and he might even spur on a few disenchanted party members, like me ( but not me.. ), to take up their bags of leaflets again. But none of them will rush out to vote for him in the numbers they did for the smiling persuasive conman in 1997. Nor, I suspect, will the army of floating voters, and they’re the ones we want. Ed might educate and influence a few people, but that won’t get Labour back into power. I once told you I voted for Andy Burnham in the Labour leadership election – and I’d do so again. Listen to him on the NHS, schools or whatever ( as I did this afternoon), and you hear principle, ideology and intelligence projected by a very appealing, straightforward personality of the sort that EM will never develop. As Tim Weakley rightly asks…why wasn’t Ed even capable of telling AM to belt up now and then? Brian writes: Thank you for this, Bob. I hope that if you heard and saw Ed Miliband’s Conference speech yesterday (2 Oct.), you will have revised your view of his leadership qualities and capacities fairly sharply. If you didn’t, it’s not too late to watch and hear the speech on the Web. This was a very different Ed from the one we’ve begun to recognise. On Tim Weakley’s comment, please see my response at http://www.barder.com/3767/comment-page-1#comment-153654. Andy Burnham’s Wikipedia entry sets out a number of compelling reasons for some of which I wouldn’t, and didn’t, vote for him in a Labour Party leadership election. I voted for Ed Miliband as the candidate who (1) had a realistic chance of winning and (2) seemed likeliest to lead the party out of Blairism, which I still think he wants to do (as his conference speech yesterday again confirmed), although progress in that endeavour has admittedly been lamentably slow.